Looking for a real scary mask to seriously frighten kids this Halloween? 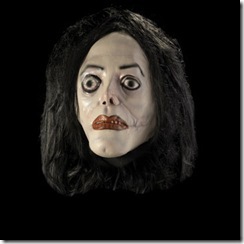 The Michael Jackson Wacko Jacko mask is a creepy piece and quite a thriller! A mixture of Vampire, Plastic-Surgery Victim, Frankenstein and Zombie…. Available at the Green Head for $30. This entry was posted on Saturday, October 20th, 2007 at 3:33 pm	and is filed under Blogging, Seasonal/Holidays. You can follow any responses to this entry through the RSS 2.0 feed. You can skip to the end and leave a response. Pinging is currently not allowed.